We are engaged in manufacturing and supplying a wide range of Power Saver. It is a modern micro processing technological device that dynamically observes and improves the consumption of power for your household, office and industry. It helps to stabilize voltages and reduce currents in your power supplies. It enhances power efficiency of electrical appliances, avoid wastage of the electricity supplies and help to extend the life span of your electrical appliances. Saving energy means decreasing the amount of energy used while achieving a similar outcome of end use. Energy saving depends on a number of parameters like input voltage, the type, rating and make of lamps, lamp burning hours. · Save energy sources efficiently. · Balance the current source. Backed by the constant support of our genuine vendors of the industry, we are able to provide an optimum quality collection of Electric Power Saver which is delivered safely at clients’ end. It uses a state of the art electrical technology to actively monitor and improve the power factor and reduce the harmonic of electrical appliances, suit for household or office. The technology optimizes the voltage and current demands to reduce the active power demands, reduce electricity bills by up to 20%. Reduced electrical overheating and improved saving consistency, so that prolong the life of your appliances. The unit provides energy savings by reducing the amount of power drawn from your utility with the use of specially designed harmonic resistant capacitors and circuit. True Micro Power Saver systems optimize your household or office power factor and reduce harmonic thus reducing the amount of energy. Your household or office motor loads use such as air conditioners, refrigerators, freezers, pool pumps, vacuum cleaners, furnace blower motors, fans, etc. Motor loads require more energy to do their work compared to other electrical equipment in your household or office. The True Micro Power Saver "power factor optimization" significantly increases the efficiency of your motor load and stores waste energy resulting in decreased demand and usage of electricity from your utility company. This equates to significant cost savings for you. 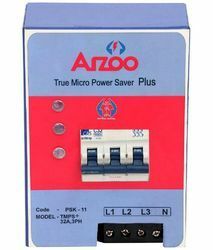 True Micro Power Saver technology also provides Harmonic Filtration, which reduce electrical current in "pulses". This pulse use of electrical current creates damaging noise, interference and heat on today's electrical systems causing interference within sensitive electrical equipment or worse causing them to overheat and fail. The use of computerized electronics within the Indian home. 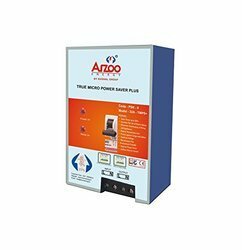 With rich industry experience & knowledge, we have been able to provide the best array of Single Phase Power Saver. It helps in optimizing the voltage and current demands to reduce the reactive power consumption. Being one of the trusted firms in the industry, we are highly engaged in providing a unique range of Three Phase Power Saver. It gives benefits like improving safety by reducing the overheating on wiring and electrical appliances to increase their life.